If you have full access permission to a shared mailbox that appears in the address book, you can use Outlook Web App or a desktop version of Outlook to open that mailbox. Why use shared mailboxes? A shared mailbox makes it easy for a specific group of people to monitor and send email from a public email address like info@contoso.com or contact@contoso.com. When a person in the group replies to a message sent to the shared mailbox, the reply appears to be from the shared mailbox, not from the individual person. 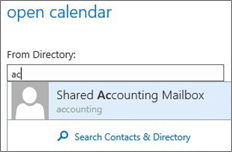 You can also use the shared mailbox as a shared team calendar. Important: The admin for your organization has to create the shared mailbox and add you to the group of users before you can use it. For more information, see Create a shared mailbox, which describes what the admin needs to do. If you want to monitor the email from your primary mailbox and the shared mailbox at the same time, use this method. In addition, after you complete this task, the shared mailbox and its folders are displayed in the left navigation pane each time you open Outlook Web App. In the Add shared folder dialog box, type the name or email address of someone who has shared a mailbox with you, and then select Add. The shared mailbox displays in your Folder list in Outlook Web App. You can expand or collapse the shared mailbox folders as you can with your primary mailbox. You also can remove the shared mailbox from your Folder list. To remove it, right-click the shared mailbox, and then select Remove shared folder. To receive notifications of new messages in the Inbox of a shared mailbox, you must open a shared mailbox in a separate browser window. Use this method if you want to view and manage the email for the shared mailbox in its own browser window. On the Outlook Web App navigation bar, select your name. A list appears. Type the email address of the other mailbox that you want to open and then select Open. Or, start typing and then select Search contacts and directory to find the mailbox you want to open. Select the shared mailbox you want to open, and then select Open. Another Outlook Web App session opens in a separate window, allowing access to the other mailbox. Tip: If you mistype the email address of the mailbox, the result is "No match was found." Try retyping the email address. Select New mail above the folder list. A new message form opens in the reading pane. Select More , and then select Show From. This option shows you that the people who receive the email message will see that it comes from the shared mailbox and not from your own email account. Note: The first time you use a shared mailbox to send an email, you won't see the name of the shared mailbox account in the Show From drop-down. For your first-time use, delete your name, type the name of the shared mailbox in place of your name, and then send the message. In the future, the name of the shared mailbox will display in the drop-down next to Show From, and you can select it. When your message is ready to go, select Send . Sign in to your mailbox using Outlook Web App, and then select Calendar. 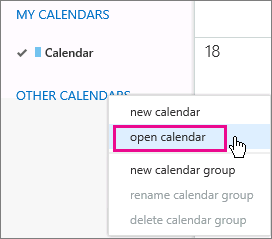 Right-click Other calendars, and then select Open calendar. In From directory, enter all or part of the name of the calendar you want to open, then select Search contacts and directory to find the calendar you want to open. Select the shared calendar you want to open, and then select Open. 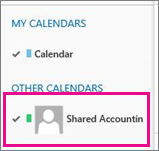 For general information about how to use the calendar in Outlook Web App, see Calendar in Outlook Web App.